Sony Ericsson's W960i is being dubbed as the Sony Ericsson's "iPhone killer" though it looks nothing like the iPhone, however, I forget that to be an iPhone killer, one doesn't necessarily have to look like an iPhone. The Sony Ericsson W960i is more featured pack than the iPhone. It has 3G, Wireless LAN, supports Stereo Bluetooth A2DP profile, 8GB of internal memory, video calling features, Symbian OS, and a 3.2 mega pixel camera. The Sony Ericsson W960i has a glossy black finish and weighs 119g which feels solid when held but still sleek and cool looking. The 3.2 mega pixel camera has LED flash and auto focus and delivers clear looking pictures though not quite good when compared with Sony Ericsson's Cyber-shot line of phones. 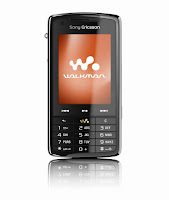 If you're a fan of Ericsson's Walkman series, then the Sony Ericsson W960i won't disappoint. It delivers clear music plus with the additions of an RDS FM radio station, you can quickly browse any FM radio station if you get tired of listening to your playlists. Battery life is also quite good and I got around 18 hours of playback before I have to recharge. External speakers on the Sony Ericsson W960i, however, leaves something to be desired as it lacks bass capabilities and music is distorted when volume is turned on too high. The response time on the menu interface is also rather slow but really not an issue. The keypad on the Sony Ericsson W960i is also rather a bit cramped and I found myself pressing two buttons at a time on some occasion, but then again, I have large fingers. I've heard that the phone does not support EDGE but then, who cares about EDGE when you've got 3G. I just wished that they included HSDPA as well. All in all, the Sony Ericsson W960i is a smart phone that delivers. It may not be an iPhone killer in terms of its looks but when it comes to functionality, it may as well give the iPhone a run for its money. Sony Ericsson is trying to hard. The W960i could never beat the iPhone. The design is waay ugly. I still think that this phone rules. It has eveything the iPhone lacks plus I always like Walkman over the iPod. The Walkman is the originator of portable music. I just got this phone and I have to say, the Sony Ericsson W960i rocks! I love the interface and the sound quality of this phone is truly awesome! I would recommend this phone to anyone who's looking for an iPhone alternative or a remarkable music phone. What I like: it's a walkman phone, nice touchscreen, QWERTY keypad. What I don't like: Could do a little more updating in terms of the design. Other than that. This phone rocks. I'd love to own this phone but it will probably cost an arm and a leg here. I prefer Motorola's Phones more. I'm waiting for the Moto Z10.